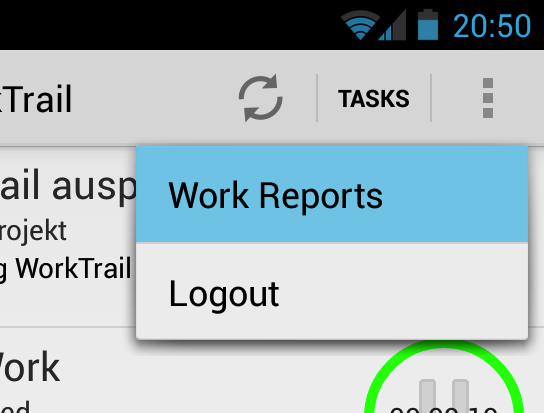 With the brand new WorkTrail Android App you can easily track your work time while on the go. It contains most features required for efficient time tracking. This includes: Start a new unassigned work, assign tasks to current and previous work entries, switching between your open work stack as well as closing your work. 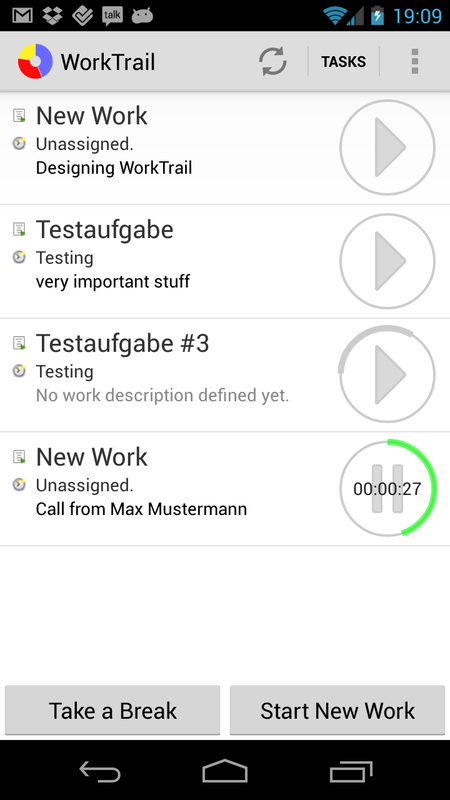 It is also possible to easily create new Tasks and Projects. 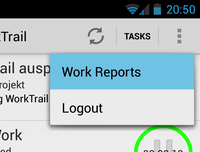 Be sure to download the WorkTrail App from the Google Play Store! When you first launch the app you will be redirected to a website requiring your login. 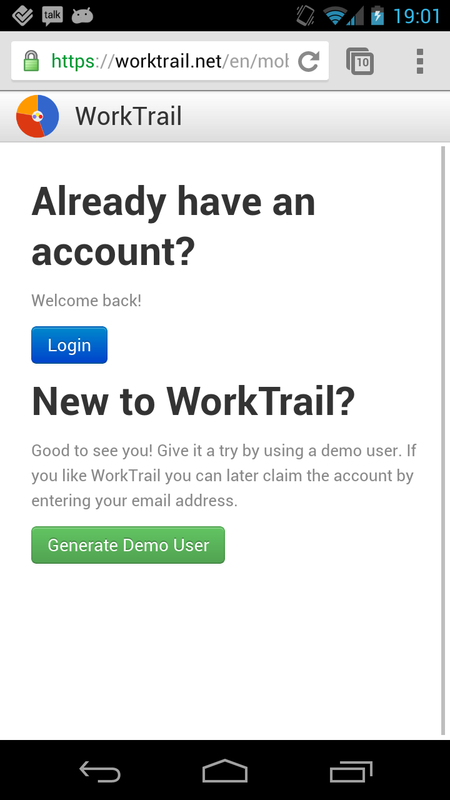 If you do not already have a WorkTrail Account, simply login as a guest user. This allows you to test WorkTrail without any registration or strings attached. Once you decide you like WorkTrail and want to use your account permanently, and also use the web application you can click on 'Claim this account' at the bottom (after creating a guest user). This will generate a random password and sends an email to you. 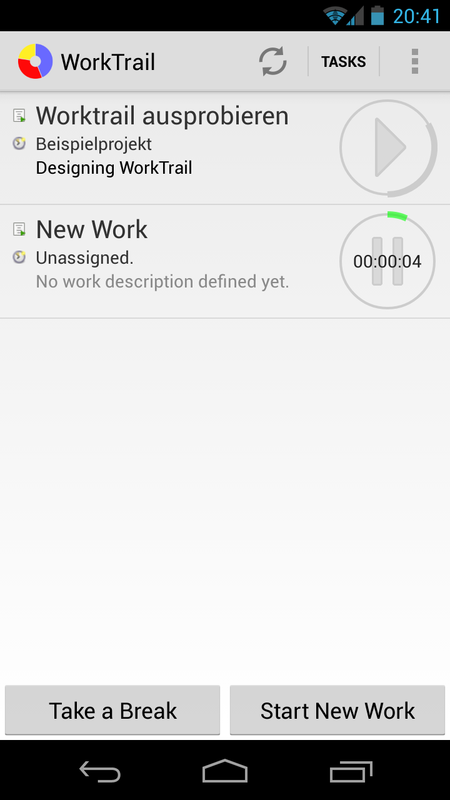 By clicking on the "Start New Work" button you can create your first logged time. The first thing you will see is a circle which will be filled up. In WorkTrail no work which lasts less than 1 minute will be logged into your history. This is to ensure that you won't have too many short-lived work entries. So until one minute is over you can always change your mind and work on other tasks. So you might want to keep it running for one full minute, until the circle has a full green outline. The most important thing to be able to associate your work later with a project or customer is to assign it to a task. 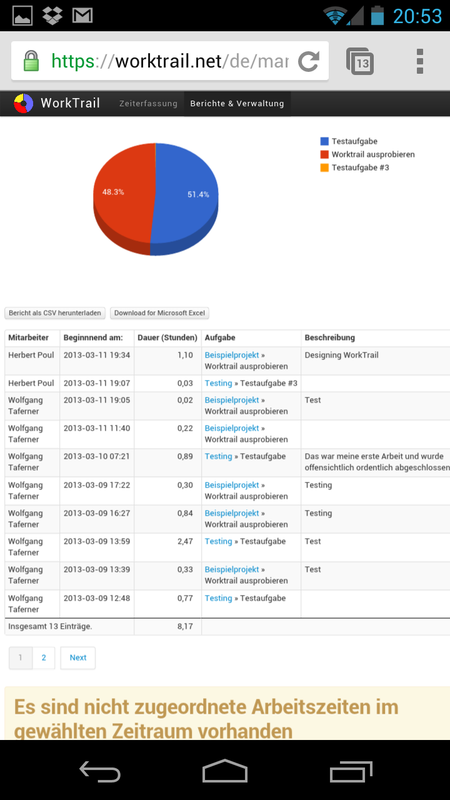 Tasks are the place where all your logged work and all of your team mate's work will be accumulated into one statistic. To do this simply press on a line of a work and a context menu will appear (see the screenshot to the left). Choose Assign task. This will get you to the list of all tasks your currently have. Select one of those tasks (e.g. Trying out WorkTrail) to assign the current work to this task. One of the most important aspects of WorkTrail is to handle work interruptions. This means that you can at all time start a new work without losing your current work stack. So without further delay start a new work by pressing the Start New Work button. As you can see the last work is still in a "pending" state, and if it turns out that your interruption happens to be just a few moments you can simply switch back and the new work will never be logged. So if a phone call comes in, just start a new work. If it's nothing major just swipe the work away, and it's like nothing ever happened. We encourage users to keep their work stack as small as possible. So only keep work open you intend to come back soon. 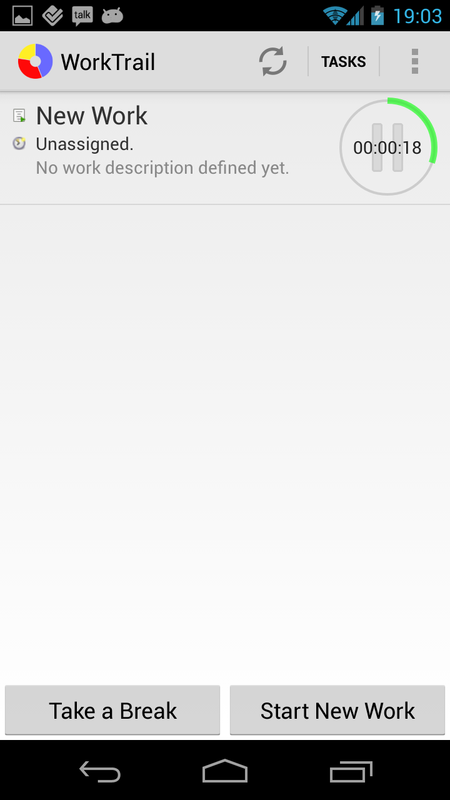 On Android you can simply close a work at any time by swiping it to the right or left off the screen. 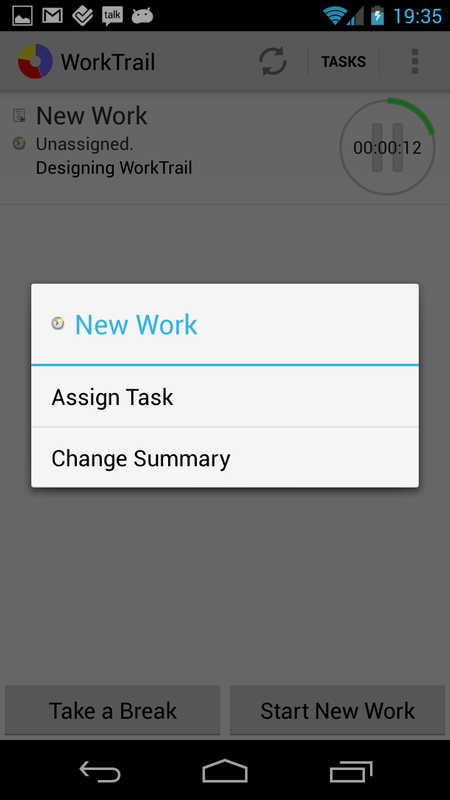 If you swipe away your currently active work, your bottom most work will be started. Once you have recorded your work time you are probably wondering how to view and download your statistics. The easiest way is simply to log into your account on our website and view it on your desktop browser. But you can also open the options menu on your Android Device and select 'Work Reports' this will log you into your account and redirect you straight to your work reports. From there you can view simple reports or download CSV and Excel reports for further analysis. 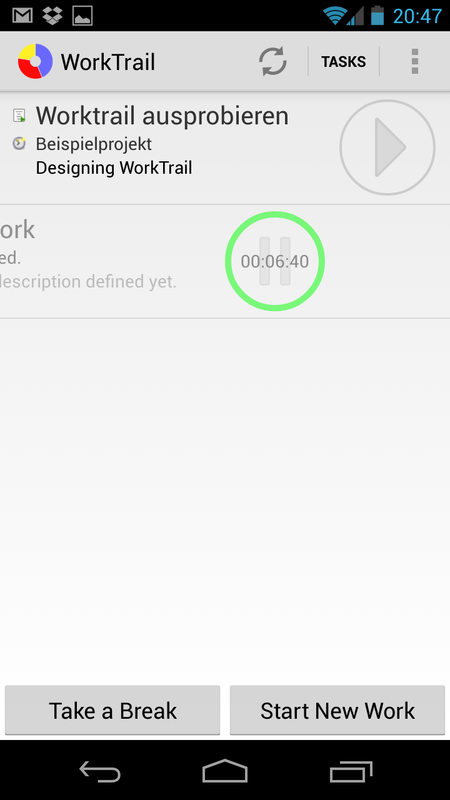 There are a few minor things you have to keep in mind with the current Beta version of the WorkTrail Android App: First, you always need an active internet connection to interact with WorkTrail. This is a limitation so we can asure that your web browser always has the same status as your mobile. Second (and related) you can only actively use one device at a time. You can obviously use multiple devices after each other, but only one device can actively interact with the WorkTrail server. This is to ensure you always have a consistent state. 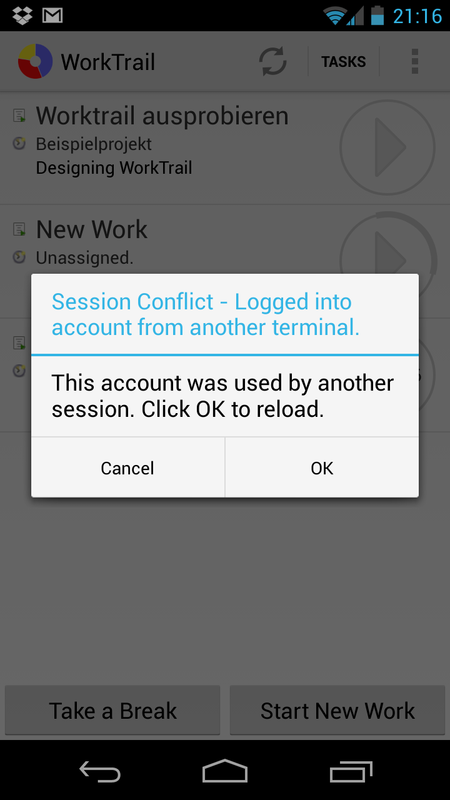 If you ever encounter a "Session Conflict" this is the reason, simply reload data and continue your work. It shouldn't take more than a second.